Boston University men’s basketball played their penultimate game of a long road trip in Durham, New Hampshire, against the University of New Hampshire Wednesday. The Terriers (4-4) ballooned an early lead by as much as 23 in the first half and never let up for an 82-53 win over New Hampshire (2-5). BU held the Wildcats scoreless for the first five minutes of the game, forcing them into tough shots that resulted in clanks off the rim. For the half, New Hampshire shot just six for 21. By the time UNH scored their first bucket, they had used two timeouts, and the Terriers had racked up 13 points. Sophomore guard Javante McCoy got BU started with two three-pointers. The sophomore guard was playing not far from Phillips Exeter Academy, where he spent his high school days. BU continued to dominate UNH in the first half, stretching their lead out to 30-9 and, eventually, 42-25 at halftime. Junior forward Tyler Scanlon led the team with 8 points, and sophomore forward Sukhmail Mathon had eight rebounds. As a team, the Terriers shot 17 for 33 from the field in the first half, including six for 15 from three. For the Wildcats, senior guard Jordan Reed led on offense with 12 points in the first 20 minutes. The Terriers finished the game shooting 52.5 percent from the field and 44.4 percent from three. On the other end, New Hampshire shot 29.2 percent on all attempts and 23.8 percent on threes. BU also won the turnover battle, forcing 14 blunders and surrendering 11. The Terriers went on to score 23 points off those mistakes, while UNH brought home 10. BU’s defense did not allow a single fastbreak point in the entire game. Scanlon led all scorers with 15 points, and McCoy was close behind with 14. The two combined to shoot nine for 18, including seven for 11 from deep. The Terriers’ bench was given plenty of minutes as well, with 13 total players getting out onto the court. 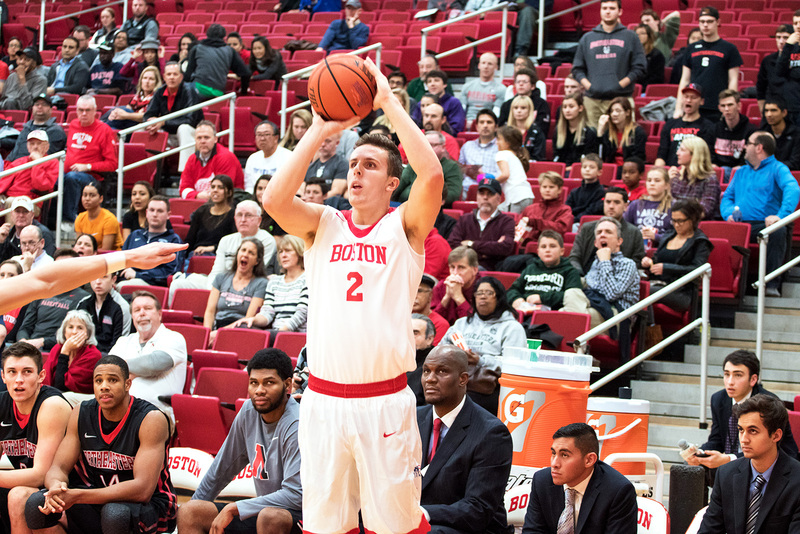 Redshirt freshman guard Alex Vilarino and freshman forward Jack Hemphill combined to score 19 of BU’s 33 bench points. Freshman guard/forward Fletcher Tynen led the subs in minutes with 18 and in rebounds with five. With the win, BU edges closer to returning home for the first time since Nov. 11. After a game at Elon University Saturday, they will return to Case Gym Dec. 4. For now, Jones said he is happy with how his team is looking and how they can continue to improve.